G.K. releases Didi Learns - The Water 1.0, their new educational app for iPhone, iPad & iPod touch devices. Didi, a little girl with a learning appetite, explores the water cycle, the sea and the river. 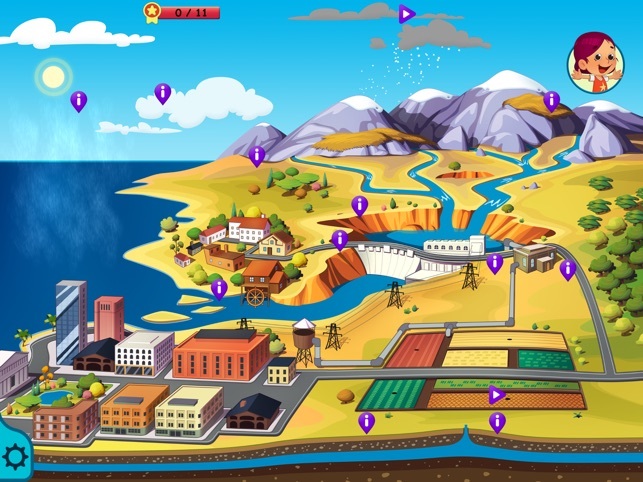 Kids can learn how the rain and snow is produced, and how the rivers & lakes are created. Traveling in a submarine, kids can explore the deep ocean and control a harbor near the river end. Kids can click on the play symbols to start an action, like start the rain and fill the mountains with snow. [prMac.com] Thessaloniki, Greece - G.K. is proud to announce the release and availability of Didi Learns - The Water 1.0, their educational app for iPhone, iPad, and iPod touch devices. Didi, a little girl with a learning appetite explores the water cycle, the sea and the river. She learns how the rain and snow is produced and how the water is used from the people. She discovers amazing creatures in the deep sea as she travels with her submarine. She can find the whale and hear its amazing song. Near by a river she helps the ships to escape to the open ocean, and the little boat to carry woods to the factory. Kids can click to the play symbols to start an action like start the rain and fill the mountains with snow. They can also click on the info signs and learn by reading or hearing about the article that they discover. Finally, they can go to the Achievements page to check all articles they discover and see what is missing to complete the three available pages. Together with Didi your kids will play and enjoy learning! Didi Learns - The Water 1.0 is just $1,99 USD (or an equivalent amount in other currencies) and is available worldwide exclusively through the App Store in the Education category. A free, lite version of the app is also available. The full version offers the complete material. Promo codes are available to members of the press. G.K. is a private company located in Thessaloniki, Greece. All Material and Software (C) Copyright 2019 G.K. All Rights Reserved. Apple, the Apple logo, iPhone, iPod and iPad are registered trademarks of Apple Inc. in the U.S. and/or other countries. Other trademarks and registered trademarks may be the property of their respective owners.